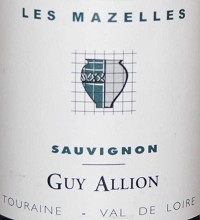 This crisp, grassy Sauvignon Blanc comes from the Touraine region of the central Loire Valley. The estate is managed according to the organic 'Terra Vitis' program, a system which encourages respect for the environment and knowledge of the terroir, parcel by parcel. Light straw in colour, the nose has aromas of plums, gooseberry and grapefruit with a hint of asparagus and herbal notes. The finish is zesty and tart with further flavours of lemon and lime. This wine is excellent with salads, fish or herbed tarragon chicken.